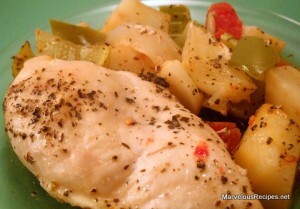 This tender spiced chicken with flavorful vegetables is sure to please your hungry family! 1. In a large bowl, combine the basil, seasoned salt, garlic powder, pepper and oil. Brush approximately half the mixture on the chicken. Add all the remaining ingredients to the remaining oil mixture in bowl; toss to coat. 2. Transfer vegetables to a 13×9-inch baking dish sprayed with cooking spray. Place chicken over vegetables. Bake, uncovered, at 400 degrees F for 45 to 50 minutes or until the vegetables are tender and chicken is no longer pink when centers of thickest pieces are cut. Serve with pan juices. Makes 6 servings.